I am using Mapbox Studio, customized a nice basemap, and downloaded it. It downloaded as a .json file with a couple thousand lines of code. Any suggestions on how to load a custom Mapbox Studio basemap into leaflet? 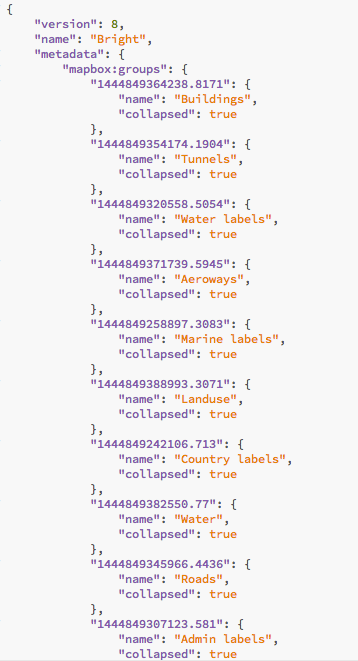 So the json file you've got contains the styles to work with mapbox.gl which isn't the same as leaflet. Mapbox have however put together a library to make mapboxgl stuff talk to leaflet. Documentation is pretty spare but look at the examples and hopefully that gives you a few ideas. Regarding self-hosting vector tiles it is certainly possible, see this post and I've also thrown together a github repo which shows something similar. Not the answer you're looking for? Browse other questions tagged leaflet tiles mapbox json basemap or ask your own question. Adding offset to GeoJSON layer in Leaflet? Problems with simple Leaflet + Mapbox TitleLayer?